The beverage producer Refres Now S.A. has heavily expanded its capacities at its La Matanza location near Buenos Aires and is now operating one of the largest facilities for soft drink production in Latin America. Daily, the company produces more than ten different products with a total volume of more than 3.5 million liters. Refres Now S.A. has a long-term relationship with DAS Environmental Expert and relies on the expertise of this long-standing partnership. The Dresden environmental experts previously installed a wastewater system when a heavy increase in production volume demanded an upgrade. For the wastewaters to meet the legal limit values and to be released into the adjacent river, the new treatment plant is capable of reliably treating a volume stream of up to 80 cubic meters (21,134 gallons) per hour with a maximum COD concentration of 3,000 milligram per liter. Wastewaters with such a high COD concentration are usually pre-treated with anaerobic processes making it possible to produce biogas, which increases energy recovery and economic efficiency. The corporate leadership in La Matanza, however, requested that the company’s wastewater treatment was to exclusively use anaerobic methods. In addition, the system had to be automated, operated with a small amount of effort, and requiring the smallest space possible. To this end, DAS Environmental Expert selected the MBBR (Moving Bed Bioreactor) also known as the fluidized bed process. In this process, biofilms of microorganisms growing on the surfaces of a filling material metabolize the pollutants. With more than 500 square meters (5.382 square feet) per cubic meter, the carrier material used by DAS Environmental Expert features an extremely large and specific surface area, thereby allowing exceptionally compact MBBR bioreactors. 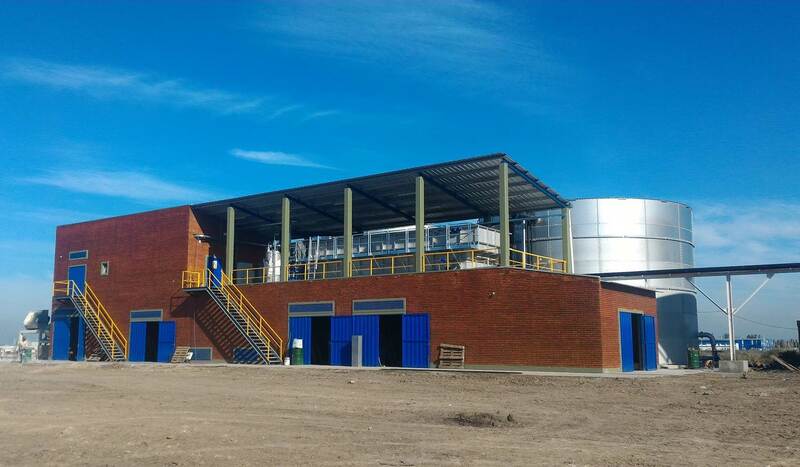 For the enormous throughput values at Refres Now in LA Matanza, DAS Environmental Expert set up four tanks. The wastewater flows into the mixing and equalization tank via an intermediate pumping station. Afterward, it reaches the reactors where microorganisms provide the COB degradation. Jet aerators circulate the wastewater inside the reactors and provide the oxygen supply. The MBBR technology will allow the Refres Now La Matanza location to further expand its production to include increasing wastewater amounts. An increase in the wastewater treatment system’s degradation capacity can easily be achieved by either increasing the carrier material volume or by adding an additional reactor to the modular-structured MBBR system.